If you want more marketing success, it takes a shift in perspective, an effort to expand your knowledge and awareness of what’s possible. There are few “sure things” in marketing, but one thing you can count on is the value of the expertise and advice from the group of 10 expert marketers contributing to the Marketers Go Pro ebook we developed for the Pubcon Pro conference in Las Vegas happening in a few weeks. We polled the keynote and main stage speakers for their best advice based on the presentations they will be giving at the conference. I’m one of those main stage speakers, so I contributed as well. To see the full text of our experts’ advice, check out the full ebook below. You’ll also find the details of when, where and what their keynote and main stage presentations will be about. Besides me, TopRank Marketing will have several team members attending and liveblogging at the Pubcon Pro conference including our agency social content manager, Lane Ellis and senior account manager, Tiffani Allen. You can follow them at @lanerellis and @tiffani_allen as well as our agency tweets during the event at @toprank. The post Stop Gambling with Your Marketing and Go Pro with Tips from Ten Pubcon Pro Speakers appeared first on Online Marketing Blog - TopRank®. Walt Disney is revamping its entire advertising sales activities for a new integrated organization. Under its new advertising group -- recently formed under Rita Ferro, president of Disney Advertising Sales -- the restructure will affect the entire company’s entertainment, sports, news and kids linear and digital TV and radio businesses. That includes ESPN and Disney/ABC properties, as well Disney's mobile, social and digital portfolio and national ad sales for ABC’s eight owned local TV stations. The integrated ad sales organization will be structured into three areas: sales, client and brand solutions, and revenue and operations. The sales group will be led by six senior vice presidents, advertising sales, reporting to Ferro: Patricia Betron, Marco Forte, Flora McKiernan, Andrew Messina, Wendell Scott, and Jeremiah Tachna. They will be responsible for managing account teams under specific industries, as well as managing dedicated agency teams. The client/brand solutions team will be responsible for providing clients insights to help grow their businesses, as well as creative solutions for storytelling capabilities for marketers. Four teams within the group will report to Ferro. 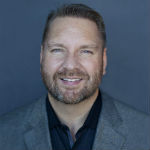 Leading each team will be: Wanda Young, senior vice president, client solutions of insights/creative; Sean Hanrahan, senior vice president, sports brand solutions; Jerry Daniello, senior vice president, entertainment brand solutions; and Zach Chapman, vice president, International Alliances. For revenue and operations, Laura Nathanson, will lead this group as executive vice president-revenue and operations, responsible for optimizing and managing business opportunities. 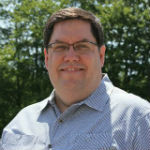 Key executives in this unit will include Doug Hochstadt, Travis Howe, James Minnich, Laura Nelson and James Vanderhoef. Additionally, Josh Mattison, vice president, business operations, will report to Ferro. Disney Advertising Sales exists under Disney’s new direct-to-consumer and international business. This unit is responsible for direct-to-consumer businesses -- including the ESPN+ premium sports streaming service; an upcoming Disney-branded direct-to-consumer streaming service; and the Disney’s ownership stake in Hulu. In conjunction with Pilot Flying J’s second year as the Official Travel Center of the SEC network, the brand is launching a campaign that positions the driver travel centers as the one-stop shop for all college football game-day travel essentials. Themed “Welcome To,” it includes creative running across TV, digital platforms and billboards that will continue to roll out in an expanded capacity through 2019. The 360-degree efforts include exclusive myPilot app promotions and partnerships with popular ESPN/SEC personalities Paul Finebaum and Laura Rutledge as well as brands ORCA, Johnsonville and Dr Pepper, Subway and Denny’s. The effort “elevates” the second year of the four-year ESPN and SEC networks sponsorship, said Whitney Haslam Johnson, chief experience officer for Pilot Flying J. The TV spot features Carol, an enthusiastic staffer who showcases what Pilot Flying J has to offer to every guest that comes through the door, including college football fans. The spot will air on SEC Network, ABC and ESPNproperties and run digitally on ESPN.com, SECNetwork.comand the ESPN app. The football-themed campaign will be integrated into a larger brand campaign. In Pilot Flying J’s home city of Knoxville, Tenn., “Welcome To” creative is being tested on billboards. Fans can pick up ORCA drinkware and coolers in travel centers across the country from Nov. 1 (or until supplies last). In SEC-specific markets, ORCA products will be regionally branded, featuring emblazoned logos of participating SEC schools. 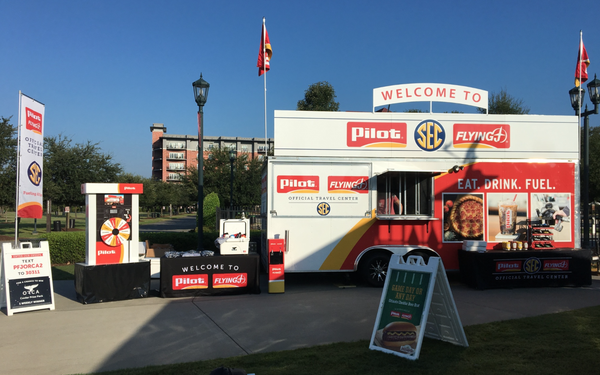 Throughout the college football season, Pilot Flying J and ORCA will also be partnering to deliver exclusive giveaway opportunities like the “ultimate tailgate package,” a weekly giveaway at all SEC Nation stops. Fans looking to upgrade their gameday gear can buy and scan a 20 oz. Dr Pepper at participating Pilot Flying J locations to receive 30% off college gameday gear. The promotion runs from through Dec. 6. The sponsorship provides exposure for Pilot Flying J on SEC Network programming and within the SEC footprint through SEC Nation, the network’s traveling football pregame show. The company will also be the presenting sponsor for three of SEC Nation’s regular-season broadcasts. The brand will bring its mobile “Fueling All Fans Experience” unit to various college campuses alongside SEC Nation, which will offer two of Pilot Flying J’s in-store food items right outside the stadium: cold brew coffee and Johnsonville Cheddar Beer Brats. Fans can also enter on-site to win the weekly “ultimate tailgate package” giveaway from ORCA and Pilot Flying J. If marketers want to map the future of search, all they need to do is track the number of times company executives mention a technology, especially during earnings calls, words in patents, and hush-hush investments such as Google’s in Gradient Ventures, a company that invests in early stage AI startups, and Google Assistant investment program. Analyze, also, the amount companies spend in research and development. CB Insights maps recent investments in terms of absolute dollars and a percentage of sales for some of the top companies. Amazon leads with $22.6 billion in 2017, followed by Google at $16.6 billion, Microsoft at $13 billion, Apple at $11.6 billion and Facebook at $7.8 billion. In terms of percentage of sales, Facebook leads with 19.1%, Google at 15%, Microsoft at 14.5%, Amazon at 12.7%, and Apple at 5.1%, according to CB Insights. Several recent patents also suggest Google prioritizes deep learning, rather than machine learning. Deep learning doesn’t require adjustments from engineers to make predictions. CB Insights notes that although AI has been a key focus for more than a year, the mention of AI and machine learning by Google executives on company earning’s calls reaches a new peak in the second quarter of 2018. Overall, CB Insights estimates about 86% of revenue comes from advertising, but rising ad costs, increased regulations, heightened competition, and a shift to mobile and voice are threatening Google’s business in search and advertising. One of the biggest threats to Google, Amazon’s large percentage of product search market share. Amazon dominates product searches, according to Survata’s annual survey, though Google re-captured some of that lost share. Product searches still make up roughly 60% of Google’s total ad click share. Another threat, Google’s traffic acquisition costs continue to increase. It has for several quarters. It is the largest expense for the company. TAC is expected to rise with the shift to mobile and regulations around data privacy. Pressure from Amazon and Apple also continue to put pressure on the company. And still, Google trails Amazon and Microsoft in terms of the market share owned by these companies. In 2018, Google took about $1.6 billion, about 8% of the cloud market. Retailers are embracing a new model, using AI, breaking down internal channel silos and fielding single-order management systems to deliver a superior customer experience. At least that’s the dream. In reality, almost half are plagued by budget constraints and/or disparate systems, according to the 2018 Customer Experience/Unified Commerce Survey by BRP. And this apparently is having an impact. For instance, 48% plan to deploy AI to fuel their customer service within three years, but only 7% are doing so now. In addition, 31% plan to use augmented reality within three years, and 21% virtual reality — again, within three years. And email? The study shows that 81% are using personal email as a means of customer interaction with the brand. But only 36% say it is working well, and 45% feel they need improvement. Social media is utilized by 94%, with 36% saying it works well and 48% saying they need improvement. And 81% are using call centers, with 36% saying they need improvement. Speaking of mobile, 93% are planning to have a mobile/tablet app for associates within three years, up from 81% in the 2017 survey. Another opportunity is in the scrapping of paper. Of the retailers polled, 17% are offering the option to email customer receipts as an incentive to encourage identification. Of course, email ranks far below more personalized service as an incentive — 37% are offering it. In addition, 30% are promoting product incentives, 27% are promoting specialized offers and 27% are promoting product information. And 37% have no incentives at all. Many retailers are also improving their cross-channel capabilities. For instance, 66% have implemented consistent product assortment across channels, but 38% say they need improvement. And 65% are offering consistent pricing/promotion across channels, with 34% saying it’s not totally successful. But only 7% offered shared cart across channels service, and all of them see room for improvement. Another 52% plan to try it within three years. One more area needing upgrading is returns visible and accepted across channels — 41% plan to implement it, but have not yet. Their biggest challenges in achieving unified commerce? BRP surveyed over 500 North American retailers. Santa Barbara, Calif. -- Enjoying bite-size video content while waiting on line at a bank, supermarket or doctor’s office is what future TV viewers, especially young millennials desire. But will they still want that when they are older? Veteran movie/TV and technology executives -- Jeffrey Katzenberg, chairman-founder of NewTV (working title) and Meg Whitman, chief executive officer of NewTV -- say millennials spend many hours a day watching videos this way, that is, while they are not using social media, texting or playing online games. But that viewing seems to be in small increments, which makes sense when it comes to mobile devices. How much bite? Around 10 minutes. Apparently, that’s all you need, says NewTV -- a mobile-first, premium video service. Can that be a business? Katzenberg, speaking at the AT&T Relevance Conference here, says many viewers are already watching regular ad-supported TV this way. For years, TV producers have worked in nine-to-10 minute continuous programming content increments on TV shows -- you know, the stuff between commercials. They actually constitute short "episodes." Will millennials who don’t have enough time to watch an entire TV episode in one sitting take in short premium TV segments on the go? In the future, one might call this “micro” binging. This could be a big ask -- even for millennials that watch traditional TV. Perhaps on mobile devices, TV viewers -- including young viewers -- perceive content differently than on a big TV screen. Big movie/TV studios are betting on the future. Katzenberg has financially backing from virtually all major traditional TV/movie studios, a massive $1 billion. That says something; they have a lot to gain. Movie studios see mobile video content and distribution as continuing to evolve and disrupt traditional media -- including the big business of premium TV and movie content. There is some science at work here. But also a lot of guess work. At its creation, Facebook probably didn’t have much science to back up a social network. But it had a hunch. Big media needs more crazy hunches. The post Digital Marketing News: Adobe’s $4.75B Marketo Buy, Google’s 20th Anniversary Neural Matching, & Facebook Lets Pages Join Groups appeared first on Online Marketing Blog - TopRank®.